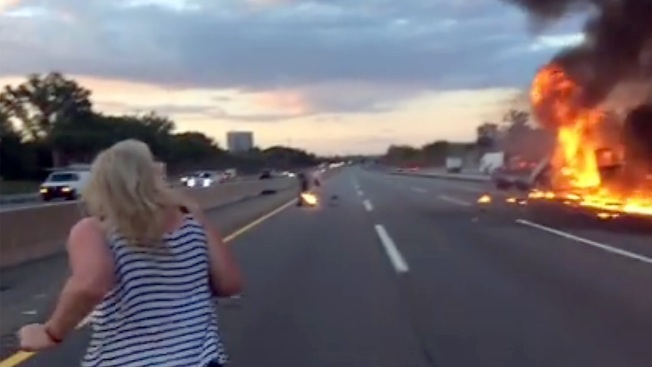 An Australian couple visiting relatives in the states will be heading back down under with an unforgettable tale after narrowly missing Wednesday’s fiery, gridlock-causing tractor-trailer crash on the New Jersey Turnpike, then rushing to aid of a driver who ran out of one of the crashed big rigs with his leg on fire. Jaqui and Anthony Wilson of Melbourne, Australia, were driving from Washington, D.C., with Jaqui Wilson’s brother, Simon Byrne, of Maplewood, when they saw the dramatic crash on the highway in East Brunswick. Anthony Wilson -- who had been shooting videos of yellow school buses -- turned his camera to the wreckage after the crash. "Within 10 seconds, the whole truck was on fire," he said. His camera also captured the moment the distraught driver of one of the trucks, which was carrying medical supplies including oxygen tanks, ran across the roadway with leg of his pants ablaze. The footage shows his wife running toward the wreckage as Byrnes helps the driver. The driver, 61-year-old Dale Miller of Harrisburg, Pennsylvania, recounted the harrowing escape to NBC 4 New York over the phone. "I knew I had to get out of the truck because everything was engulfed in flames, so something inside me told me to jump," he said. He jumped about 15 feet over a guardrail into the other lanes of the highway as the flames went up his body. He recalled one of the Australian bystanders telling him to drop and roll, but "I figured that wasn't going to do anything." "I told him, 'Let's see if I can get these pants off before I get burned alive here. It was diesel fuel. I either needed a fire extinguisher or someone to cover me in sand or take my pants off," he said. Miller continued: "There was a young gentleman that helped me get my pants off, and the other gentleman let me use the phone to call my son. I thanked them because they saved me a great deal of punishment and suffering." All three helped Miller until ambulances arrived, and then finished their drive back to Byrnes' home. Miller had been transporting medical equipment from Philadelphia and had two stops in Plainview and Riverhead before returning. Officials categorized his injuries as non-life threatening, but he told NBC 4 New York he was having a tough time in the burn unit at St. Barnabas Hospital. "I'll probably never work again. I don't know if I'll get the use of my hands. My one leg looks like someone put it over the rotisserie -- it's well-done, swelled up twice the size," he said, noting that doctors were still assessing how many surgeries he will need. Still, he knows how lucky he is. "I'm amazed, and other people have said it, that I'm talking to you right now. I don't know how I got out or what caused me to do that. I wasn't going to last long in that truck," said Miller. The other driver wasn't seriously hurt either, despite the massive blaze that gutted both vehicles. Jaqui Wilson said their next stop is Hawaii, but their experience Wednesday night is the one they’re telling their kids about.